We were invited for lunch with Marie and Vincent Tricot not long after our Fête du Vin in Chassignolles at the end of July. 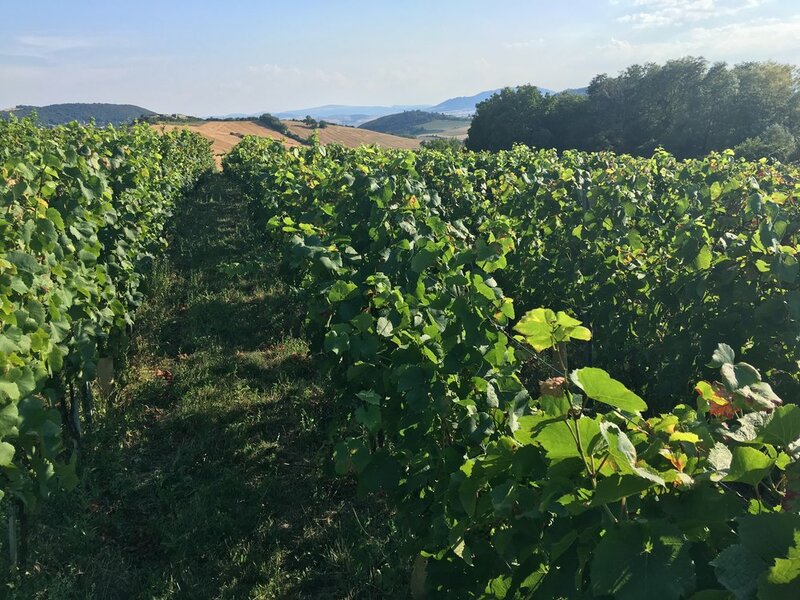 The usually refreshingly temperate Auvergne was in the grip of the same heatwave that seemed to hold all of Europe for much of this summer; that Sunday certainly felt like one of the hottest. And so, it was with no small amount of pleasure that we ascended the steps to the Tricots’ cool and shaded dining room for aperitif. Marie and Vincent moved to the town of Orcet in the Auvergne in 2002 with their two young daughters. Vincent had been working in a winery in the Gard, and before that had studied oenology in Beaujolais while working with Patrick Cotton. 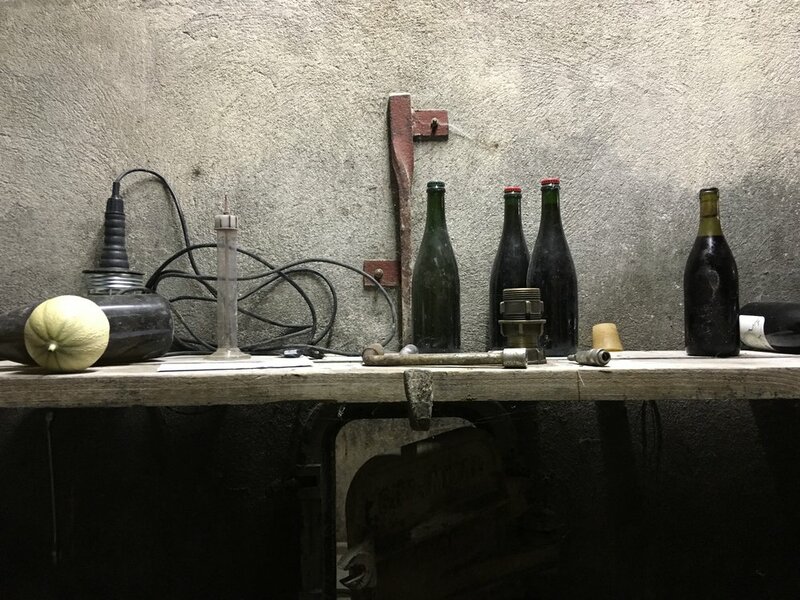 It was here that Vincent was introduced to an alternative approach to winemaking and farming—Patrick had worked for both Marcel Lapierre and Jules Chauvet. It was on a visit to relatives of Marie who lived in the Auvergne that they heard about a domaine for sale, but not just the vines, the cellar, the chai and the house as well. That the previous owners had also been farming organically and using wild yeasts for fermentation since the ‘60s provided Vincent and Marie was all the incentive they needed. The Tricots’ cellar, into which we descended after lunch, occupies the ground floor, and two below that, beneath their house. As we squeezed in among the barrels, Vincent hopped up on to one and dipped his pipette into it. This was the Petit Rouge de la Côte Ouest from 2017—not yet ready, but a delicious and bright expression of Gamay. The pipette plunged into another barrel; the same wine, but very different. This one dark, mellow and rich. Marie declares her preference for the second and Vincent goes on to explain his plan for blending the various barrels to produce something harmonious. Leaving our glasses, we delved further into the cellar, down steep and precarious steps, minding our heads and brushing aside the sea of cobwebs before us. On the lowest level the floor is covered with bottles; this is their personal cellar. There are even a few from before Marie and Vincent’s time, but it is mainly a catalogue of their vintages since 2002. As the afternoon crept on, Vincent drove us up to the vines, visible from the house and just a stone’s throw away up the slopes. 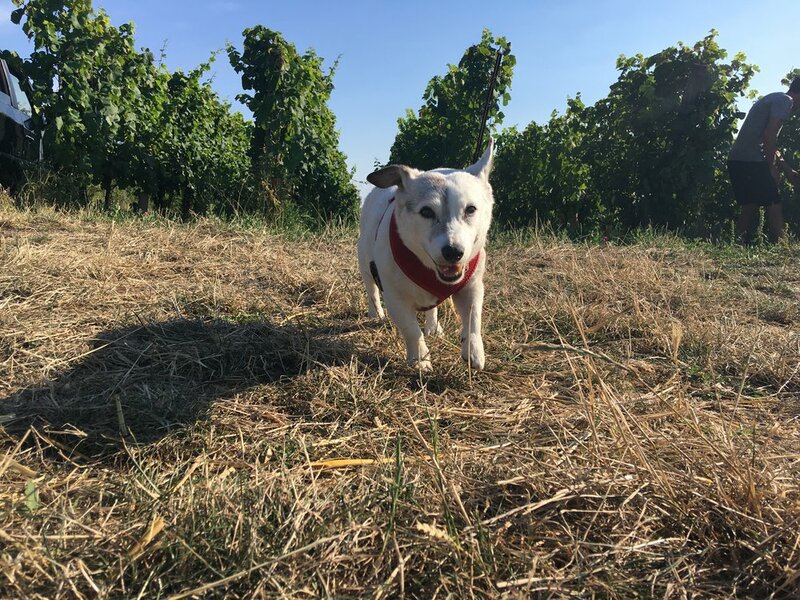 With the sun beating down on us, it was with some huffing and puffing that we toured the incredible vineyards that Marie and Vincent have been tending. They are lucky in being secluded and that, having been organic for so long, the vines and land around are in excellent health. Along with the typical Gamay d’Auvergne, Pinot Noir and Chardonnay of the area, Vincent has planted Muscat, Aligoté and Sauvignon Blanc. He is fascinated to see how these varietals fair in the Auvergne. His other big planting project has been fruit and nut trees—almonds, apricots, plums, walnuts—which line the vineyards and provided some much needed shade on that sweltering afternoon. We left Marie and Vincent after that lovely day, having met them many times before, affirmed in our opinion of them not only as two of the most conscientious and skilled winemakers, but as some of the most lovely people that we have the pleasure to work with.